Inspirational story from David Lear this week! 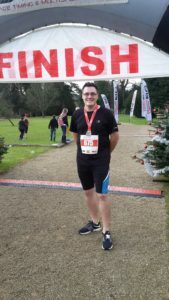 “I have set myself a 10k Challenge. My aim is to complete as many 10K runs across the Bristol area throughout the rest of 2016, starting with the Warmley 10k Weekender on 4th June. Having been touched by so many stories of people including celebrities losing their fight with cancer over the past few months I started to realise how many people this really effects. Then, just 4 weeks ago I felt my life was turned upside down when my own dad was diagnosed with an aggressive malignant brain tumour. He is to undergo intensive surgery within the next week and then weeks of radiotherapy and chemotherapy. What hit me the hardest was when we were told that if he does not undergo this surgery then he will have just 2 months left to live. This has changed my whole outlook on life. Things that I would have once found frustrating now seem so small and insignificant. Setting myself this challenge will help me focus on staying positive for my dad with his fight against cancer. After undergoing an 8 hour surgery and 6 full weeks of radiotherapy – dad is now 4 months into his chemotherapy – we are anxiously awaiting the results of a scan he has had recently to see if the treatment he has had so far has been successful or not.